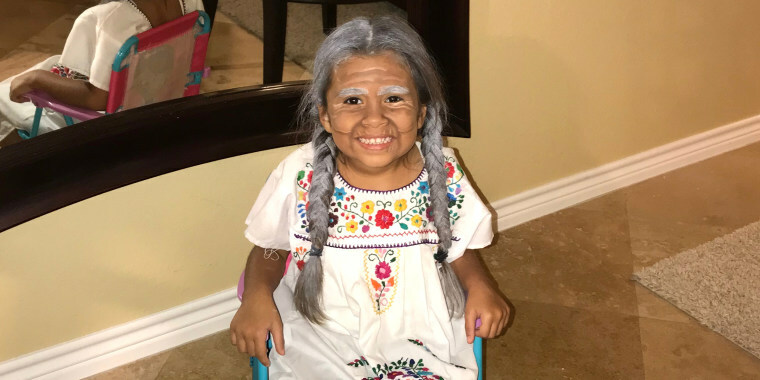 After a difficult day, one mom needed a fun distraction so she photographed her daughter dressed as Mama Coco and the response was incredible. After a challenging day, Noraelia Rodriguez dressed her 5-year-old daughter, Khloe, as Mama Coco from the Pixar movie “Coco.” Rodriguez snapped a few pictures and sent them to her son Alejandro, a Marine stationed at Camp Pendleton. When he shared the pictures on Twitter, they quickly went viral, with people collectively ‘awwwing’ at the young girl dressed as a great granny. Rodriguez’s boss recently passed away after a four-year cancer battle and she was experiencing a lot of grief. As a way to distract herself, she considered exercising. But when she reached for a hair tie, her hand grazed a bottle of gray hairspray dye from a past Halloween costume. Suddenly, Rodriguez knew what she needed to do to boost her mood: Have an epic costume session. It took Rodriguez about 12 minutes to transform her daughter from kindergartener to great grandma. After braiding Khloe’s hair in long braids, the two sprayed it with the gray temporary dye. Then Rodriguez used a contour palate to create wrinkles. Khloe, a huge fan of the Pixar movie, already had the dress. This Halloween she’s dressing as Mama Coca and her cousin will go as Miguel. “Doing it just cheered me up,” Rodriguez explained. Khloe also loved it. But she’s always adored playing dress up. As soon as she could walk, Khloe would haul a rolling suitcase full of costumes with her. But being Mama Coco on a random day in September felt like an extra special treat. “Khloe didn’t want to take it off. She wanted to sleep with it on,” Rodriguez said. The family enjoys dressing up and often wears group costumes. Last year, Khloe was Belle, her brother, Gerardo Castilleja, was the beast, and Rodriguez was Lumiere. A previous year, Rodriguez was Rainbow Brite and Khloe was Twinkle. “I love Halloween and just dressing up with the kids,” Rodriguez said. But Khloe hamming it up as Mama Coco was just what the Rodriguez family needed during a trying time.